From left, John Lindsey, Chris Carter, Brad Snyder, Eduardo Nunez, Daniel Descalso, Mark Trumbo. ST. PETERSBURG, Fla. -- Pacific Coast League Most Valuable Player J.P. Arencibia of Las Vegas, International League Most Valuable Pitcher Jeremy Hellickson of Durham and Albuquerque's John Lindsey, who led Triple-A with a .353 batting average, are among the 10 players selected to the Topps Triple-A All-Star Team. The best performances in all Minor League Baseball classifications are again being honored by the Topps Company of New York in conjunction with Minor League Baseball. Mark Trumbo, 24, of Orange, Calif., led Triple-A with 36 home runs and 122 RBIs. The Salt Lake Bees first baseman led the Pacific Coast League with 103 runs, and his 70 extra-base hits tied for best in the circuit. The Los Angeles Angels of Anaheim selected Trumbo in the 18th round of the 2004 Draft out of high school. Daniel Descalso, 24, of San Carlos, Calif., hit .282 with 32 doubles for the Memphis Redbirds. Despite missing a month of the season after suffering a hairline fracture of his collarbone while trying to make a diving catch, the second baseman finished among the league leaders in runs scored with 86. The St. Louis Cardinals chose Descalso, named the second baseman on last year's Topps Double-A All-Star Team while with Springfield, in the third round in 2007 out of the University of California at Davis. Russell Mitchell, 25, of Cartersville, Ga., led Pacific Coast League third basemen with a .958 fielding percentage while playing for the Albuquerque Isotopes. He finished in the top 10 in the league in batting average, runs, hits, extra-base hits and doubles. The Los Angeles Dodgers chose Mitchell in the 15th round in 2003 out of high school. Eduardo Nunez, 23, of Azua, Dominican Republic, hit .289 with 25 doubles for the Scranton/Wilkes-Barre Yankees. His .976 fielding percentage was among the best for shortstops in the International League. The New York Yankees signed Nunez as a free agent in 2004. He was the shortstop on the 2009 Topps Double-A All-Star Team when he played for Trenton. Wladimir Balentien, 26, of Willemstad, Curacao, Netherlands Antilles, hit .282 with 78 RBIs for the Louisville Bats. 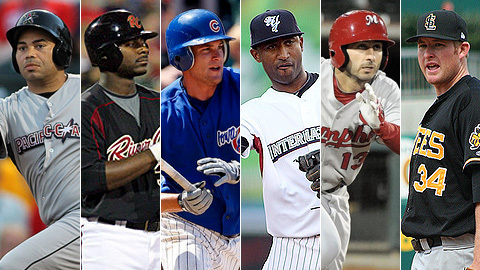 The outfielder finished in the top five in the International League in homers, slugging percentage and OPS. The Cincinnati Reds acquired Balentien in a July 2009 trade with Seattle. Chris Carter, 23, of Redwood City, Calif., made the switch from first base to left field this season. He smacked 31 home runs and plated 94 for the Sacramento River Cats. Carter's 92 runs and 73 walks also ranked among the Pacific Coast League leaders. The Oakland Athletics acquired him as part of a December 2007 trade with Arizona. Carter was named the first baseman on the 2009 Topps Double-A All-Star Team when he played for Midland. Brad Snyder, 28, of Tampa, Fla., hit .308 with 25 home runs and 106 runs batted in for the Iowa Cubs. The outfielder ranked among the top 10 Pacific Coast League hitters in runs, total bases, doubles, homers, RBIs, extra base hits, slugging percentage and OPS. The Chicago Cubs claimed Snyder off waivers in September 2008. J.P. Arencibia, 24, of Miami, hit .301 with 32 homers and 85 RBIs on his way to earning MVP honors in the Pacific Coast League. In 104 games, the Las Vegas 51s catcher had a .626 slugging percentage and a .986 OPS. The Toronto Blue Jays selected Arencibia in the first round in 2007 out of the University of Tennessee. John Lindsey, 33, of Hattiesburg, Miss., led Triple-A with a .353 batting average and a .657 slugging percentage. The Albuquerque Isotopes first baseman tied for the classification lead with 70 extra-base hits, and his 1.057 OPS was second best in Triple-A. The Los Angeles Dodgers signed Lindsey as a free agent in December. Jeremy Hellickson, 23, of Des Moines, Iowa, went 12-3 with a Triple-A best 2.45 ERA in 117 2/3 innings. The Durham Bulls right-hander held hitters to a .238 average, struck out 123 and walked 35 in being named the International League's Most Valuable Pitcher. The Tampa Bay Rays drafted Hellickson in the fourth round in 2005 out of high school.